Drinks World chats with Annemarie Sagoi. 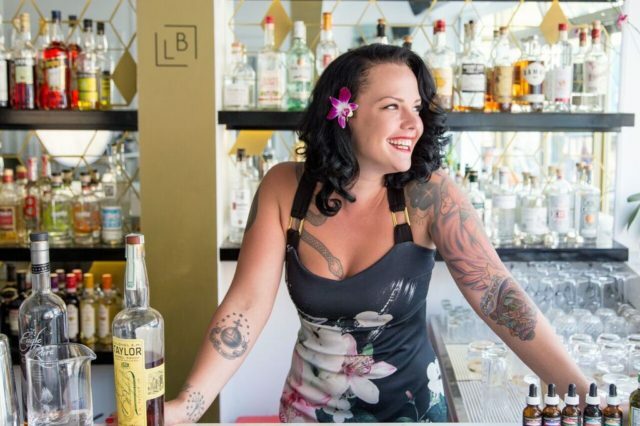 Having moved to Phnom Penh from Chicago, Annemarie opened up a craft cocktail bar, of which she is Managing Partner. Inspired by the golden era of Cambodian rock ‘n’ roll, her quaint venue has been embraced by the community. Reflecting on her experience thus far, Annemarie tells us about the local bar scene and the challenges she has faced working abroad. After living abroad for a few years, I moved to Chicago to continue my career in Art Program Directing at a University, but was unsuccessful in finding any positions. To make ends meet, I was fortunate enough to get a job bartending at a fantastic place called Nightwood, and then fell in love. Ever since then I have been passionate about exploring new flavours, techniques, history and processes that make up the beverage industry. You were recently in Singapore for Cocktail Week. What can you take away from the experience you can apply in your own bar? After being in Phnom Penh for a bit, reconnecting with my peers and friends from around the world really inspired me to keep striving for a high level of quality for not just my city, but internationally. How did you come to the decision to open a bar in Phnom Penh? we both fell in love with the city. After I left, he notified me that a place was for sale in a popular neighbourhood for cocktails, and I immediately agreed that we should open there. DW: Who are your regular drinkers, expats, locals and / or tourists? Though most of our guests are Westerners that live in Phnom Penh (mostly French and Australian), we have a good deal of Cambodians as well. Our focus is on the Golden Era of Cambodia, so there is a lot of information, pictures, and music that celebrates the rich history. Many local people appreciate that. What is the palate profile of your regular drinkers? Many people prefer light, citrusy drinks that are not too strong. I can see it slowly starting to shift with my regulars though; they are being more adventurous and starting to enjoy stronger/bitter drinks now as well. Were there any challenges, when setting up the venue? There were quite a few challenges, and still are, being that we’re only 3 months old. Cultural norms are very different. For example – never saying “no” even if that is the correct answer, the extremely high value placed on “keeping face” in public, product availability, etc. What is it like living and working in Phnom Penh? It is a bustling city with beautiful smiles everywhere you look. Construction is near constant as the economy has been rapidly growing for a long time. For my personal life though, it is a slower pace of life than Chicago, which I quite enjoy. Are spirits accessible in Phnom Penh or are there challenges? I can get most spirits here, due to La Familia who import from Proof & Co in Singapore. So basically, anything that is available there is available here. The taxes are dramatically lower – a bottle here costs a half or one third of what it does in Singapore. California wines, tequila, and mezcal are more expensive though, since they travel farther. What local ingredients do you like to introduce to your customers that they might not be so familiar with? I enjoy using local fruits like Longan, as well as stranger ingredients like fish sauce. Sometimes it takes a little explanation but so far, they have been well received. What is the bar community like in Phnom Penh? Is the industry developing? The last 2 years have seen massive amounts of change. There are cocktail bars, speakeasies, local craft beer brewers, and a rum distillery that all sprang up in a matter of a few years. I really enjoy the creativity of the owners, workers, and patrons of this community. Tell us about your Signature Drinks? I tried to bridge Chicago-style cocktails with the local palate. For example, the Cambodian Space Cocktail (whose name references a local band) combines rye,Yellow Chartreuse, sweet vermouth, and has a spritz of Kampot pepper – a highly coveted peppercorn only available in this region.